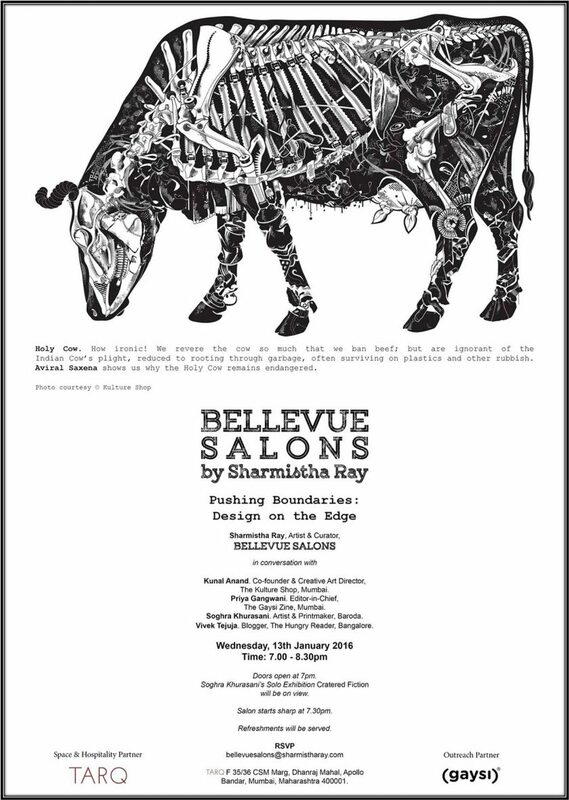 Bellevue Salons was initiated in 2014 to provide a critical space for collaboration, dialogue and experimentation. 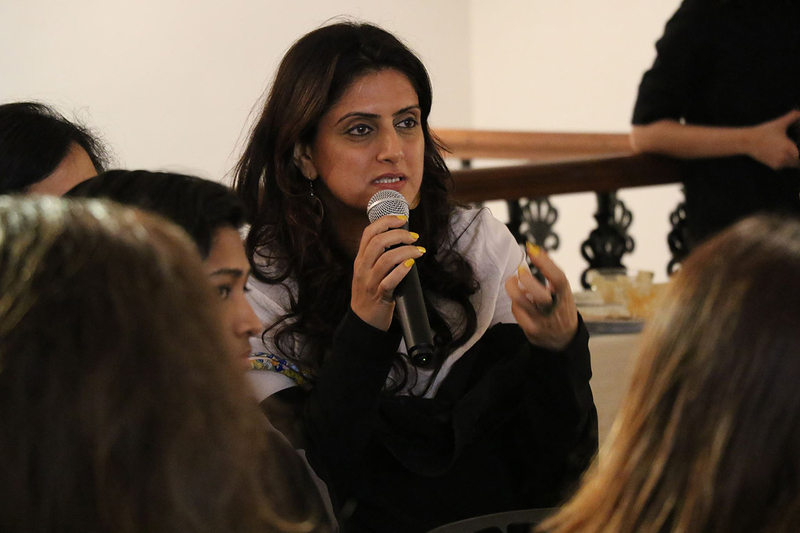 Over three years, culminating in August 2017, Ray hosted a dozen salons in Mumbai, with one offsite in Goa. Collaborators included visual artists, thespians, journalists, writers, poets, musicians, environmentalists, culinary artists, feminists and queer activists, working on the experimental fringes of contemporary urban culture. The first salon was held in Ray’s studio, later morphing into an itinerant hub. The salons’ envisioned a utopian community of creative practitioners and diverse audiences networked by a common desire for freedom of expression, social justice and cultural reformation. If you are interested in hosting a salon in your city, please email me at studio at sharmistharay dot com. Please include your profile, CV and a short proposal. Guidelines coming soon. 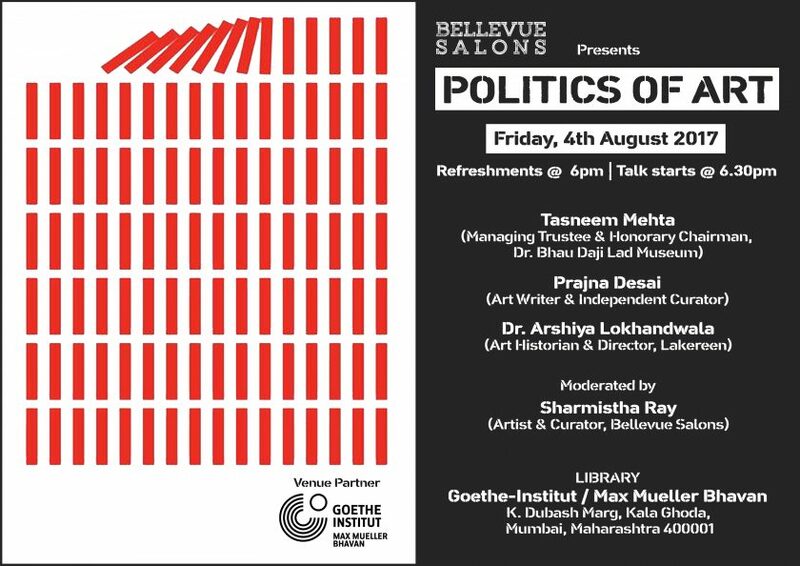 Politics of Art brings together three prolific curators in conversation to address the politics of art in current times. The conversation will address three key areas: the political aesthetic, the nature of censorship and the role of the artist-citizen in troubling social climes. Tasneem Zakaria Mehta (Dr. Bhau Daji Lad Museum), Dr. Arshiya Lokhandwala (Lakeeren), Prajna Desai. Library, Goethe Institut – Max Mueller Bhavan, Mumbai. 4 August, 2017. 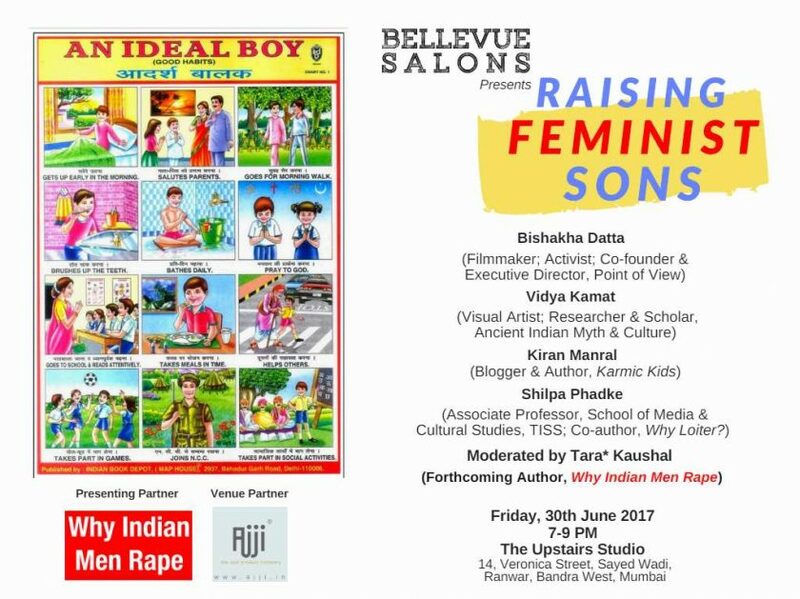 Raising Feminist Sons conceptualized, curated and arranged in partnership with Tara* Kaushal brings together experts that weigh in on the virtue of raising feminist sons. Bishakha Datta (Activist), Vidya Kamat (Artist), Kiran Manral (Blogger), Shilpa Phadke (Author). The Upstairs Studio, Mumbai. 30 June, 2017. 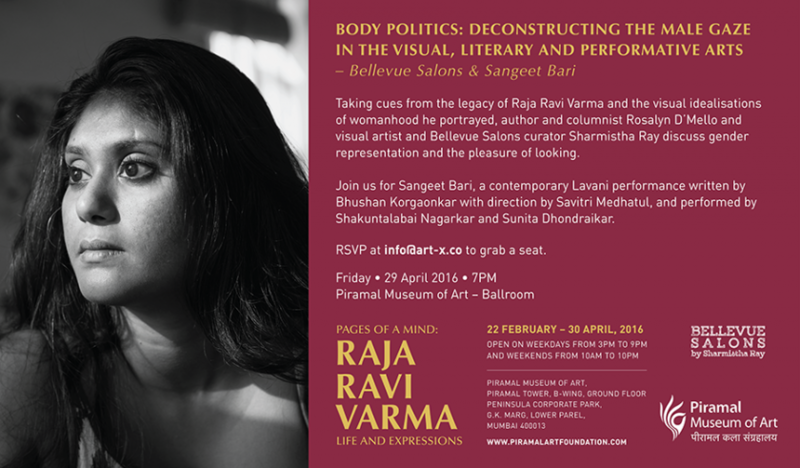 Body Politics is a conversation between visual artist and Bellevue Salons curator Sharmistha Ray and art critic and author Rosalyn D’Mello about the male gaze in visual, literary and performing arts. The evening ends with a traditional Lavani dance performance with a contemporary twist. Produced by Art-X Company. Piramal Museum of Art, Mumbai. 29 April, 2016. 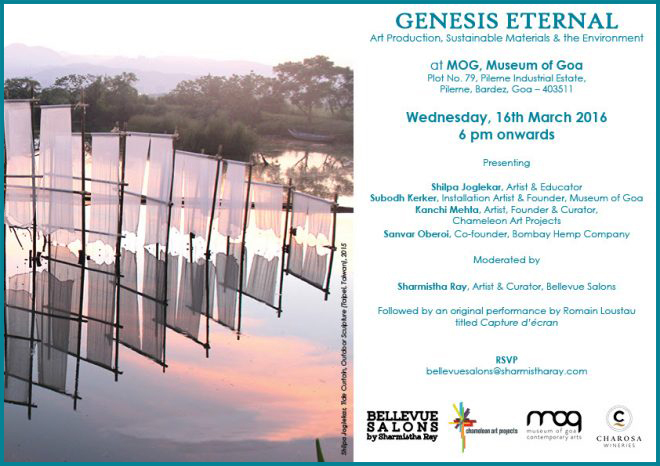 Genesis Eternal is conceptualized, curated and arranged in partnership with Chameleon Art Projects. Bringing together a consortium of voices that posit an understanding of the various forms of artistic interventions in nature taking place in the Indian milieu. 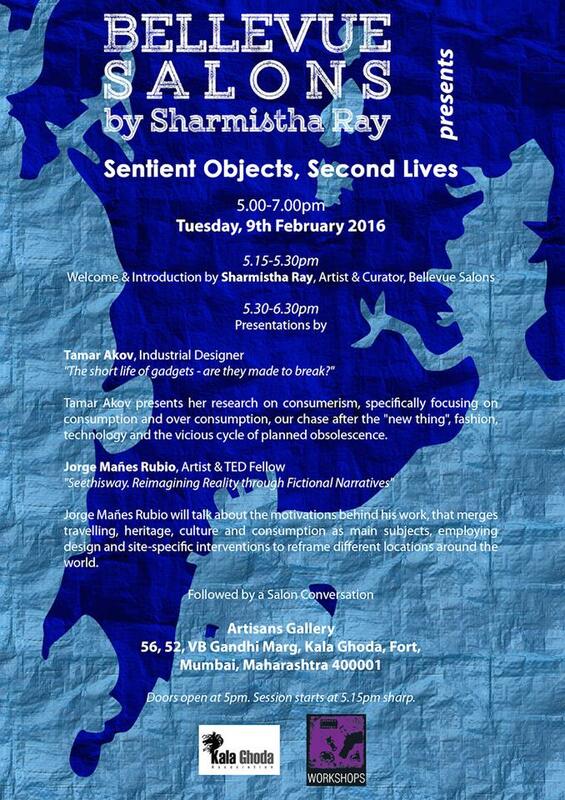 Kanchi Mehta (Curator), Shilpa Joglekar (Artist), Sanvar Oberoi (Bombay Hemp Company), Subodh Kerkar (Artist). Museum of Goa, Goa. 16 March, 2016. Sentient Objects, Second Lives explores two divergent perspectives on recycling and sustainability. How do we impart a second life to objects, and imbue them with a sense of meaning? Industrial Designer Tamar Akov and Artist & TED Fellow Jorges Mañes Rubio expound on different points of view. Artisans Gallery, Mumbai. 9 February, 2016. Pushing Boundaries brings together a host of emerging voices from across India comprising of artists, practitioners and curators across a spectrum of artistic and audience engagement in the urban space, with broad perspectives on art, design and communication as a medium of contemporary expression – one with continuing political, social and cultural agency. Kunal Anand (The Kulture Shop), Priya Gangwani (The Gaysi Zine), Soghra Khurasani (Artist), Vivek Tejuja (The Hungry Reader). TARQ, Mumbai. 13 January, 2016. 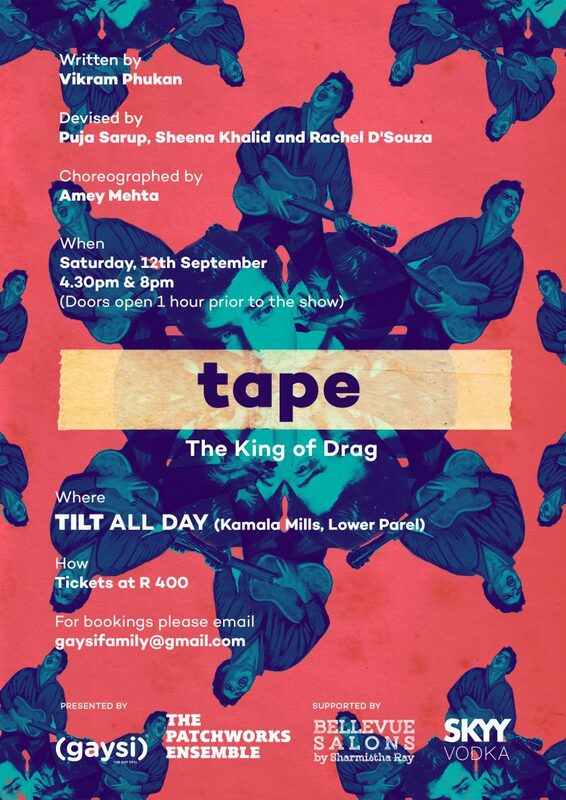 TAPE: The King of Drag is an improvisational theatre production by The Patchworks Ensemble. Produced by Gaysi Family and scripted by playwright Vikram Phukan, India’s first ticketed drag-king performance promises to be ground-breaking. Sponsored by Bellevue Salons. Tilt All Day, Mumbai. 12 September, 2015. Mythic Beings witnesses the unveiling of a figurative painting with political themes by the artist held at her studio in Mumbai. Performing musicians Joi Barua and Geetu Unplugged are invited to compose and perform original songs. Sharmistha Ray Studio, Mumbai. 17 July, 2015. 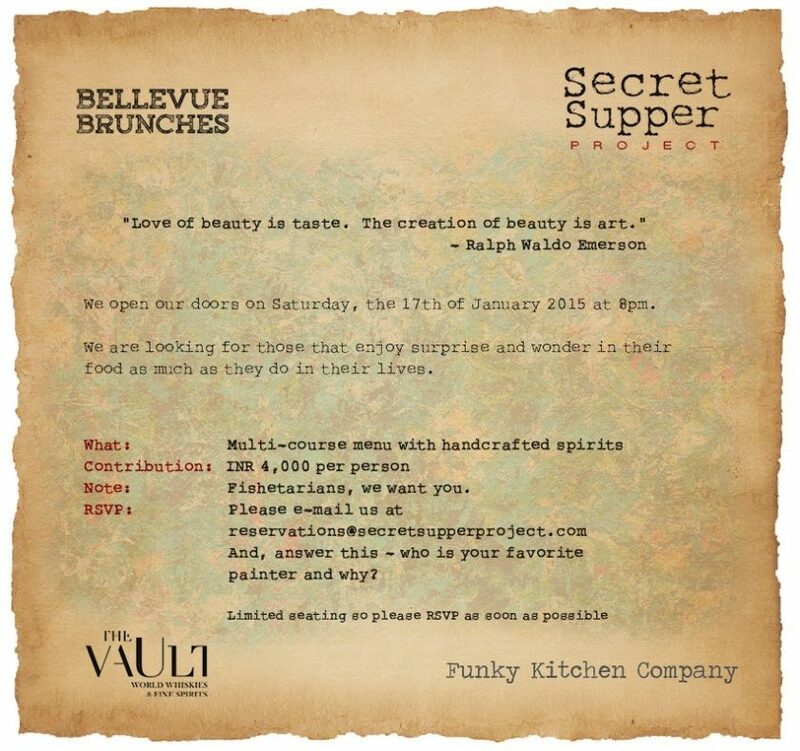 Secret Supper Project is a collaboration between Bellevue Brunches and experimental initiatives in the F&B segment to produce a sensory dinner experience with art and fine dining in an alternative location in the city, overlooking the Arabian Sea. The all-seafood menu will be curated by an emerging chef from the Funky Kitchen Company. Paired with bespoke spirits courtesy of The Vault. Private residence, Mumbai. 17 January, 2015. 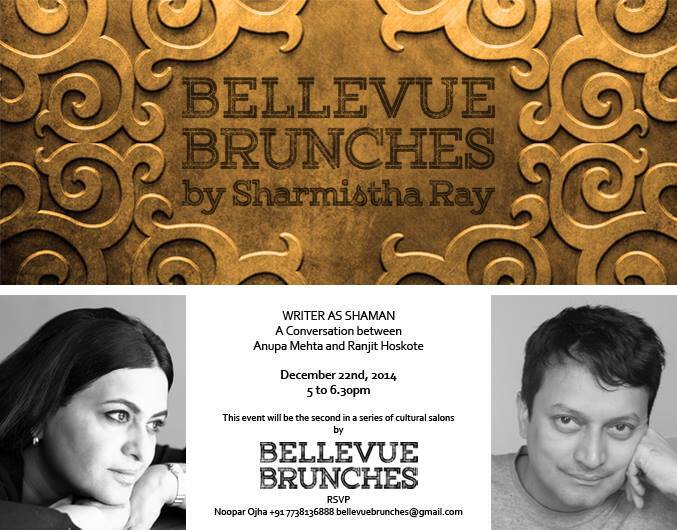 Writer as Shaman is an intimate conversation between author Anupa Mehta and poet Ranjit Hoskote about forms of modern-day shamanism that engender the art of writing. Sharmistha Ray Studio, Mumbai. 22 December, 2014. 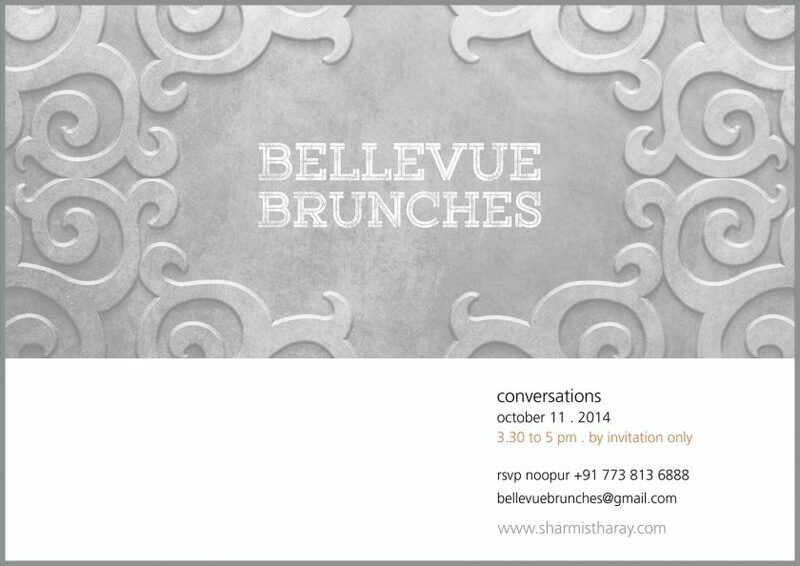 Bellevue Brunches is the launch of an open studio & cultural salon concept to which the public is invited. The week-long open studio ends with a salon with dynamic professionals in the art world who are opening up new channels for art in the city. Elise Foster Vander Elst (Asia Art Projects), Gitanjali Dang (Khanabadosh), Ashok Sukumaran (CAMP). 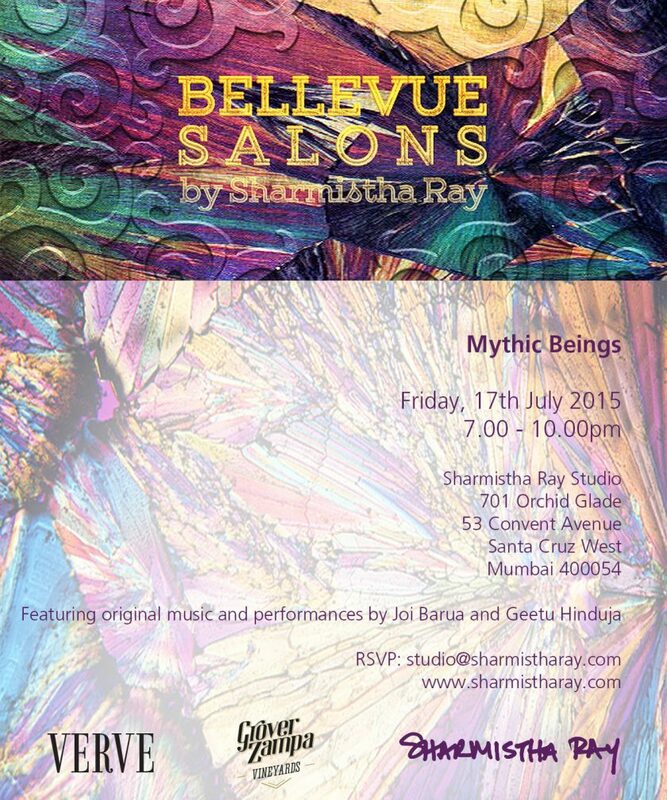 Sharmistha Ray Studio, Mumbai. 5-11 October, 2014.